I love a good babka and it is one of my favorite Easter treats. For those who may not be familiar with it (if you are a Seinfeld fan you ought to know), babka is a Polish/Russian Easter yeast bread. I was on the phone with a New Jersey cousin this past week and asked if she had a good recipe for babka. She had a Polish mother in law so I thought maybe she had some wonderful secret family recipe. Instead, she said she never made one because she always bought it fresh from an excellent local Polish bakery. I was envious because there are no Polish bakeries where I live and and babka is not sold in grocery stores here. I have tried making it in the past but never had much success. It was always too dry or the filling not flavorful enough. I liked the ones I brought back in my suitcase from New Jersey better. 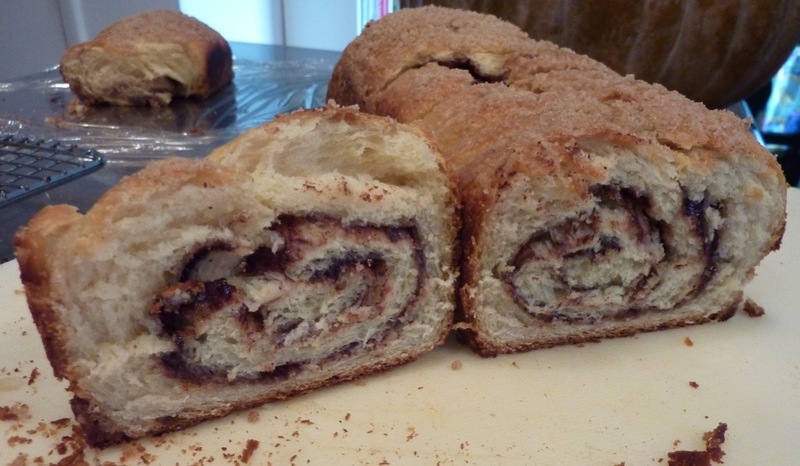 Last week I was teaching my children how to make cinnamon rolls when the thought occured to me that if I modified the roll dough and filling I could probably come up with a good babka. The technique for both is the same. So developing a moist and flavorful babka became my goal for the week. I am happy to report that I succeeded. I looked at many recipes for inspiration, including authors Martha Stewart, Nick Malgieri, Peter Reinhart, Deborah Madison, and Gourmet magazine. This recipe is an adaptation using elements of all those sources. This recipe is enough for two babkas, I made one with cinnamon filling and the other chocolate. They are both very good. Both fillings are listed below. In all honesty, it is a time-consuming recipe. But I found breaking down the steps into a two-day process doesn’t make it such an overwhelming task. It just takes a bit of organization. Make the dough the night before; it takes about 10 minutes because there is no kneading involved. Mix everything in the mixer then place in a greased bowl; cover and chill overnight. The next day, let the dough come to room temperature for 2-3 hours. It should double in volume. Make the filling and streusel while the dough is coming to room temperature. Make the egg wash and melt the butter just before you are ready to roll out the dough. Also, note that these instructions work at the altitude I live in, which is 4,500 feet above sea level. I have found that yeast doughs are lighter and fluffier in high altitude than at sea level. I used locally milled 00 flour (also known as Doppio Zero) with good results. You can use all purpose. One last note of caution. The dough should be very sticky. It is more batter-like in consistency than a kneaded elastic yeast dough. Resist the urge to add more flour than the recipe calls for. A sticky dough makes a light yeast bread. That is what you are looking for. In a small bowl mix yeast, pinch of sugar and warm milk. Whisk to combine and cover tightly with plastic wrap and let sit 5 minutes until foamy. In a mixing bowl combine 2/3 c. sugar, melted butter, the eggs and yolk, sour cream and vanilla extract. Mix well. Then add yeast mixture. Add salt and flour one cup at a time. Mix until a sticky, batter-like dough forms. Place dough in a greased bowl. Cover tightly with plastic wrap. Let rise two hours if making the same day or chill overnight. The next day let dough sit out at room temperature for 2-1/2 to 3 hours in a warm place like the stove top until it comes to room temperature and is doubled. While the dough is rising, combine the filling ingredients for whichever filling you prefer and mix the streusel by combining dry ingredients then cut in the butter. Keep streusel cold until ready to use. Just before rolling the dough out, melt butter for brushing dough, then combine egg wash ingredients. Divide the dough in half. It is sticky so sprinkle some flour on a flat surface. Place half of the dough on floured surface and add a bit of flour (maybe a teaspoon) to the dough to make it more manageable. Don’t knead it. Roll into an 11×6 rectangle. Brush dough with melted butter and sprinkle with half of the filling of your choice. Spread on dough leaving 1/4 inch border around the edges. Roll up like a jelly roll and then twist the dough. Place in a greased 12×4 or regular size loaf pan. Brush the twisted roll with egg wash then pat the streusel topping all over the top of the dough. Repeat with the other half of the dough. Cover loaves and let sit in a warm place (I like to turn the oven on at this point to 350 degrees and let the dough rise near it.) Allow dough to rise about 1-1/2 hours until it doubles. Bake in a 350 degree oven for 25-30 minutes until bread is golden. Do not over bake. Check if the dough is cooked with an inserted toothpick. Cool on a rack for 10 minutes. Then use a spatula to go around the edges and remove bread from the pan. Cool completely on the rack before eating. Tastes best the same day you make it. This entry was posted in Breads, Breakfast, Desserts, Easter. Bookmark the permalink. I would LOVE the babka recipe. Oh, and one more request – the timballo with beschamel and chicken and mushrooms. I have been thinking about it ever since our last phone call.